Shooting is underway! Disney has released an official press release and first look set photo from Marvel Studios' upcoming sequel Captain America: The Winter Soldier, perfectly timed almost one month before Iron Man 3 kicks off this year's summer movie season. 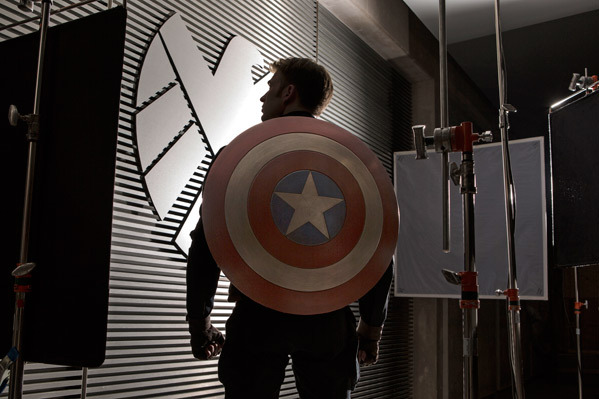 The first look photo only shows Chris Evans returning as Cap standing on the set (the objects to each side of him are lighting stands and reflectors, not props) with the iconic shield strapped to his back, standing in front of the other iconic S.H.I.E.L.D. image. This might be right before one of the scenes in the concept art recently posted, but nonetheless, it's exciting knowing production is underway on this sequel - especially with the cast and crew they've landed this time. Up first, here's the very first set photo in full from Marvel's sequel Captain America: The Winter Soldier, which started shooting this week in Los Angeles and is being directed by brothers Anthony and Joe Russo. BURBANK, Calif. (April 8, 2013) – Following in the footsteps of the record-breaking Marvel Studios' release, "Marvel's The Avengers," production on the highly anticipated release, Marvel's "Captain America: The Winter Soldier" has commenced in Los Angeles, Calif., with production also including locations in Cleveland, Ohio, and Washington D.C. Directing the film is the team of Anthony and Joe Russo ("Welcome to Collinwood") from a screenplay written by Christopher Markus ("Captain America: The First Avenger") & Stephen McFeely ("Captain America: The First Avenger"). Marvel's "Captain America: The Winter Soldier" returns Chris Evans ("Captain America: The First Avenger," "Marvel's The Avengers") as the iconic Super Hero character Steve Rogers/Captain America, along with Scarlett Johansson ("Marvel's The Avengers," "Iron Man 2") as Black Widow and Samuel L. Jackson ("Marvel's The Avengers," "Iron Man 2") as Nick Fury. In addition, film icon Robert Redford has joined the all-star cast as Agent Alexander Pierce, a senior leader within the S.H.I.E.L.D. organization. "Captain America: The Winter Soldier" is set for release in the U.S. on April 4, 2014. "Captain America: The Winter Soldier" will pick-up where "Marvel's The Avengers" left off, as Steve Rogers struggles to embrace his role in the modern world and teams up with Natasha Romanoff, aka Black Widow, to battle a powerful yet shadowy enemy in present-day Washington, D.C.
Based on the ever-popular Marvel comic book series, first published in 1941, Marvel's "Captain America: The Winter Soldier" features an outstanding supporting cast that includes Sebastian Stan ("Captain America: The First Avenger," "Black Swan") as Bucky Barnes/Winter Soldier, Anthony Mackie ("The Hurt Locker," "Million Dollar Baby") as Sam Wilson/Falcon, Cobie Smulders ("Marvel's The Avengers," "How I Met Your Mother") as Agent Maria Hill, Frank Grillo ("Zero Dark Thirty") as Brock Rumlow and Georges St-Pierre ("Death Warrior") as Georges Batroc. Rounding out the talented cast are Hayley Atwell ("Captain America: The First Avenger") as Peggy Carter, Toby Jones ("Captain America: The First Avenger," "The Hunger Games") as Arnim Zola, Emily VanCamp ("The Ring 2," "Revenge") as Agent 13 and Maximiliano Hernández ("Marvel's The Avengers," "Thor") as Agent Jasper Sitwell. Marvel Studios' President Kevin Feige is producing the film. Executive producers on the project include Alan Fine, Louis D'Esposito, Victoria Alonso, Michael Grillo and Stan Lee. The creative production team on the film includes director of photography Trent Opaloch ("Elysium," "District 9"), production designer Peter Wenham ("21 Jump Street," "Fast Five"), editors Jeffrey Ford, A.C.E. and Mary Jo Markey, A.C.E. ("Star Wars: Episode 7," "The Perks of Being a Wallflower") and three time Oscar®-nominated costume designer Judianna Makovsky ("The Hunger Games," "Harry Potter and the Sorcerer's Stone"). They're already building solid buzz for this following up the excitement for Iron Man 3 and Thor: The Dark World, both due out this year. It's important to note that the cinematographer is Trent Opaloch, who is Neill Blomkamp's cinematographer from Elysium and District 9 and this is his other big breakout gig following those two movies. I was sitting in Comic-Con's Hall H a few years ago when they announced "The Winter Soldier" title confirming the Bucky storyline, and everyone around me went insane, more than I've seen before. We'll continue to keep you updated on this production as Marvel keeps shooting, as well as all the other major Marvel Studios projects in Phase Two leading up to The Avengers 2 in 2015. Excited? Oh my god, the GSP rumour was true? That is awesome. I just rewatched the first Captain America and when Cap saves Bucky from the POW camp he's strapped down to a gurney in a laboratory of some sort. This means they've been planning on doing The Winter Soldier storyline for a long time. I love how intricately Marvel plans their films. That and you technically never saw him die. Without knowledge of The Winter Soldier experiments most movie goers would expect a 400' fall would kill a man. The last Cap movie was one of the better comic book movies in recent times. I enjoyed it more than Thor and The Avengers. It's all subjective.